Made of Oeko Tex 100 certified merino interlock wool. Similar to the Babee Greens Classic but now in a wrap style! The snaps are reinforced with a small section of hidden cotton between the two layers of wool so the snaps stay strong over the life of the cover. The wool is jersey knit so it is stretchy and since it's merino, it is soft and comfy. Don't size up. This is a roomy cover. The size large will be wonderful on older toddlers or preschoolers. When it is time to wash it, please wash by hand in a proper wool wash to keep it soft and in shape. Made in the USA. Small on a 12 pound 4 month old. It is big on her now but it works very well and there is a lot of growing room in this. Small will fit over a medium Workhorse diaper. Shown on baby over a size small Workhorse. Link to Babee Greens Classic style version. My 23 pound, 12 month old was quickly outgrowing the Babee Greens Large "classic" covers and these were the perfect upgrade. They are much roomier than the "classic" style, we can even use them overnight with extra cotton, yet are not too bulky for the day. I'm predicting to be able to use these through full potty learning. I love wool, and I love Babee Greens! Wish I knew about this before the cord stump fell off! This was my first baby, and I had registered for my diapers & covers on amazon and intended to get some diapers on this website myself before baby came, but then she arrived early and I ended up using what I had at the time and I didn't get around to ordering more until around 2 weeks. This was a perfect newborn cover, IMO. 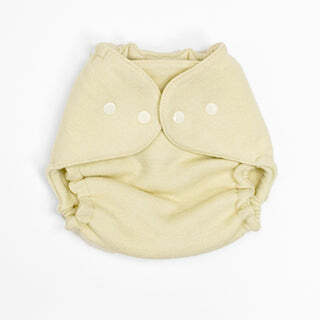 I love wool and intend(ed) to use primarily wool & cotton, and organic for my diapers. While I had received an organic wool cover from Sckoon in newborn size with velcro fasteners as a gift, it did not fit under a cord stump, in addition to not really ever completely fitting my baby. It was giant around her legs (she did have skinny legs), and she outgrew the waist pretty quickly, only able to fit that cover without much leaks for a short period of time, maybe 2 weeks. This was lovely, quite soft (Though not as soft as the Sckoon). It my baby from size "preemie" through size small. (She was not a legit NICU preemie, just a small newborn in preemie size clothes and diapers.) At size small I just snapped one snap on the last snap for each side. It worked and I had no leaks and no marks on her legs. She hated diaper changes initially, so having a quick diaper (snaps) was quite helpful for making it quicker & less stressful. She did not like the XS/preemie/newborn size pull-on wools initially, just lifting her bottom a little and placing it under her & wrapping around was much less stressful than pulling on a cover/putting her legs in things. I did not have really any leaks with this cover, as long as I was putting on her diapers correctly/using well fitting diapers. I like that this is OEKO tex certified & made in USA. Also, this was pretty trim compared to other covers I have, if you care about that. I only wish I had gotten more, and definitely will for my next baby. I'd consider this a newborn must have for myself. So far I really like what I've purchased from Babee Greens. So I’ve been wanting to try this wrap style cover for some time and finally decided to splurge and get one. I have two in diapers currently, both are special needs, they’re 5yrs and 2yrs old. My 5yr old has a lot of sensory stuff going on and I’ve tried just about every other “bigger” option out there, even made some of my own since I sew, but she hasn’t liked the texture of the materials or the fit is really awkward and/or isn’t natural materials which I do prefer when cloth diapering. I took a shot and ordered the size Large for her, she’s 42lbs and hoped beyond hope it would fit and to my surprise it does fit! It fits well with room left over!! I’m SO happy about this. And she loves it! She loves how it feels, looks and fits. So do I. It’s super soft, I love the natural creamy color, it’s made very well! I will be buying a couple more to rotate. Washed once, lanolized twice. I love this cover! I wish I could get another one in the next size up. 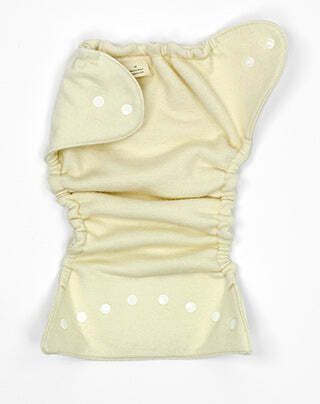 Baby is quickly growing out of the small especially with the prefold or fitted underneath being a little more bulky. He's 3 months, 15 lbs, and I have been putting him in intermediate prefolds and medium workhorses (Both a little big but I didn't want to buy anything smaller he would grow out of quickly). I like that I can feel when he pees (feels a little damp and warm) and I can change him right away. Haven't tried it at night yet, in sure it's great. Soooooooooo soft. I would love to try the Babee greens pants as well. I’m new to wool - but really like this cover as it’s trim and very stretchy. I got this one and the other style babee greens cover- and I do think the other non-wrap style cover with the snaps on the side gives a better fit over all and is my first preference now. Otherwise, besides the closures- the two layered fabric and protection is the same.